Anti age limit demonstrations have rocked Uganda’s capital, Kampala, as speaker, Rebecca Kadaga, allows the bill to amend presidential age limit to be tabled for debate in parliament. Uganda Inspector General of Police, Kale Kayihura had last week, in a statement, advised that planners of demonstrations can use other forms other than processions to allow parliament to “debate in peace”. 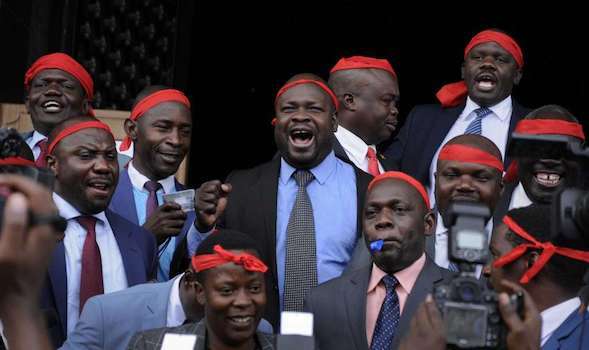 Uganda Police this Tuesday, has arrested former presidential candidate, Dr Kizza Besijye and other political leaders opposing the bill, as they joined in the demonstrations. The tabling of this bill was canceled last week, after, mainly opposition members of parliament disapproved the Ugandan army surrounding parliament. Museveni, who is now 73, will be two years older than the current age limit in the 2021 election and will be ineligible to vie as president.